The pantheon of Ancient Greek gods is a theme which is utilised by a great many slot games, and Battle of the Gods is another which falls into that category. This five reel, three row and 25 payline alternative takes things a step further, however, by pitting the gods against the titans in a battle for the ages. Through that theme, the slot manages to offer players the chance to win a momentous payline jackpot that can be worth up to £500,000 and also introduces two fascinating forms of free spins that can prove equally beneficial. 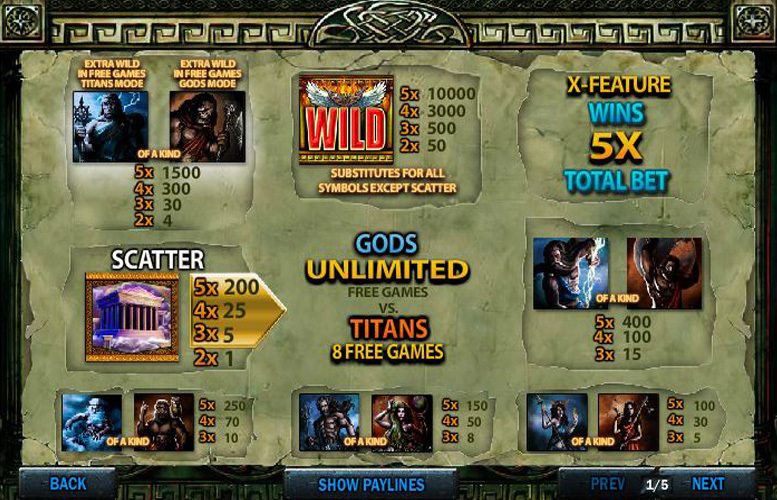 The Battle of the Gods maximum payline jackpot of £500,000 is not just unbelievably generous but is also amongst the very best such payouts you will find anywhere. Wild symbols and Scatters introduce even more ways in which players can receive impressive payouts. Not one but two different kinds of free spins enhance winning potential still further and make gameplay really fun and immersive. A great range of staking options means that Battle of the Gods is suitable for high and lower rollers alike. The various extra features of the Battle of the Gods can be a little difficult to understand at first but aside from that, the game has very few weaknesses. Before we even get to the many exciting extra features of Battle of the Gods, the slot’s top payline jackpot is well worth taking some time to talk about. As with most five reel slots, the jackpot is achieved when five of the game’s most valuable symbols extend along an active payline after a spin. The top paying Battle of the Gods symbol is its flaming wings wild, which pays out at an impressive rate of 10,000 times the player’s line bet for a five symbol combination. If the maximum line bet of £50 has been selected, therefore, the jackpot will be worth a breath-taking £500,000. Not content with boasting one of the most generous payline jackpots around, Battle of the Gods also includes a whole host of fun additional features. These are namely its wild symbols, scatter symbols, two modes of free spins and an innovative ‘X-Feature’. Able to make up the most valuable payline combination possible, as mentioned earlier, the flaming wings wild also works by substituting for all symbols other than the slot’s scatters. Such substitutions always occur in order to make up the most valuable possible payline combinations. Showing off an image of the Parthenon, the Battle of the Gods scatter symbols deliver instant wins if two or more of them appear on the reels at once. If three of them appear on reel three at the same time, too, an unlimited number of ‘Gods Mode’ free spins are triggered. If three appear anywhere on the reels at once, meanwhile, it is eight ‘Titans Mode’ free spins which result. 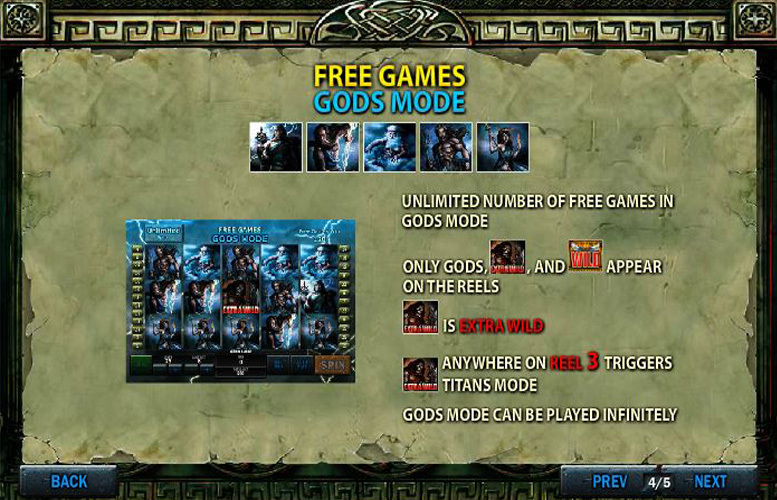 Gods Mode free spins take place on reels which include only the game’s blue god symbols, the wild and one red titan symbol which works as an extra wild. Whilst an unlimited number of these are triggered, if the extra wild appears on reel three at any time, free spins transfer to Titans Mode. 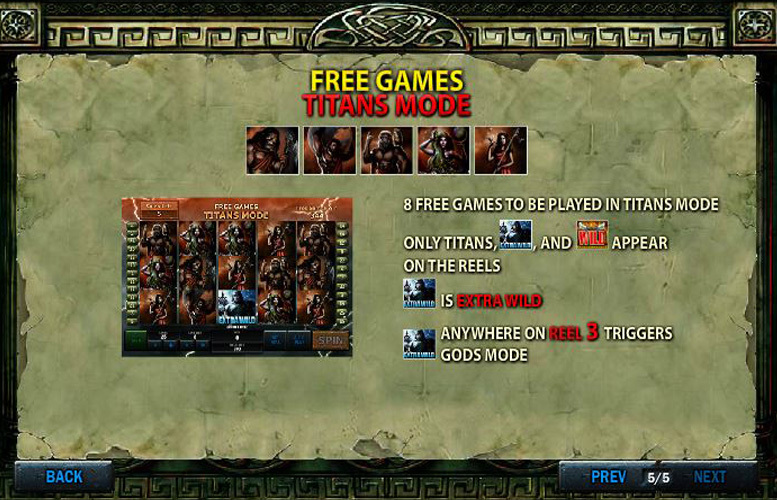 Eight Titans Mode free spins can be triggered at any one time, and use reels featuring only the red titans symbols, the wild and one blue gods symbol which works as an extra wild. If that extra wild ever appears on reel three during free spins, it triggers Gods Mode free spins. 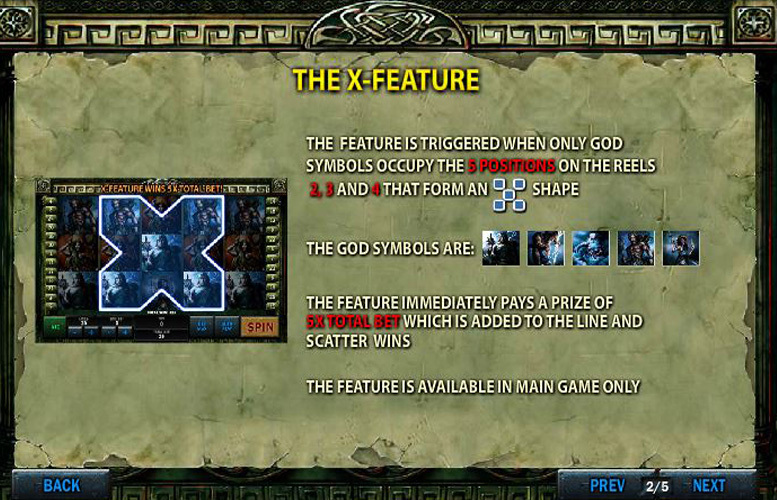 During the main game only – not during either mode of free spins – Battle of the Gods players will receive a payout worth five times their total bet if only gods symbols appear in the spaces on reels two, three and four which form an ‘X’ in the centre of the reels. Away from the special symbols and features, the Battle of the Gods reels are populated with either blue images of Greek gods or red images of titans. The most valuable of each type of symbol is the Zeus symbol and the Atlas symbol respectively. If a player is lucky enough to see five of a kind of either of those symbols line up along an active payline, they will receive a jackpot worth 400 times their chosen line bet. It is worth mentioning, too, that during free spins a five symbol combination of either of the extra wild symbols is worth 1500 times the line bet. It is quick and easy for Battle of the Gods players to alter the amount they wish to wager per spin, and there are two different ways in which they can do so. Firstly, they are able to change the number of paylines active for each spin and secondly, they can vary the amount they wish to bet per active payline. It is possible to activate anywhere between one and 25 paylines for each spin, and there are a multitude of line bet options between the minimum of 1p and the maximum of £50. In terms of overall limits, therefore, a minimum total bet of just 1p is possible and a maximum of £1,250 is also available. Normally at this point of a review we would dissect the strengths and weaknesses of a slot game in order to provide an overall view of the title. In the case of Battle of the Gods, however, there are only positive points that are worth mentioning. The slot, after all, boasts not only one of the most generous payline jackpots around but also includes loads of fun and beneficial extra features. Wilds, scatter wins, the ‘X-Feature’ and two types of free spin all add extra winning potential to the slot as well as making the game more fun and immersive. 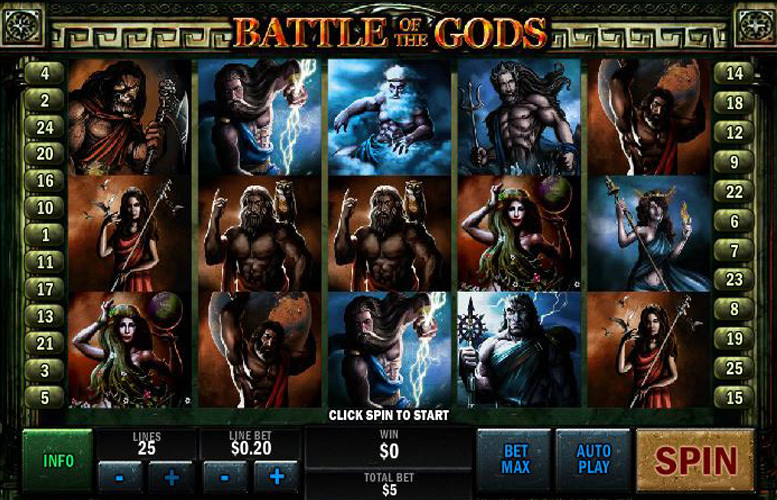 No matter what you look for in a slot, therefore, Battle of the Gods is an innovatively themed alternative which you are sure to find to your liking. This game has a rating of 5 / 5 with 641 total reviews by the users.